As an elementary teacher, I don’t often get to see where my students end up in life. Colleagues teaching in high school watch their students climb the stage at graduation, winning scholarships and awards I rarely hear about. As my eleven year olds leave, I can only predict the progress they may make, or challenges they may face in coming years. A few years ago I ran into the parents of a student I had taught some fifteen years earlier. I remembered their daughter Amy Jo as a happy, active student with a blonde ponytail and beautiful blue eyes. When I asked what she was up to, her parents beamed. “She’s a rocket scientist,” her mom said. I admit that at first I thought they were kidding. She was serious. The adorable ten year old who loved softball and coloring pictures was now a rocket scientist working for a private company stationed at Hill Air Force Base. She shared with me that Amy Jo often credits our after school Young Astronauts program for launching her interest in space flight. 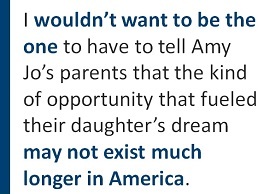 I wouldn’t want to be the one to have to tell Amy Jo’s parents that the kind of opportunity that fueled their daughter’s dream may not exist much longer in America. 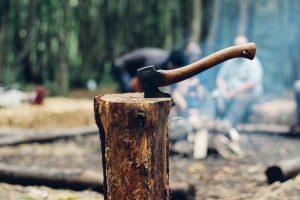 Educators across the country paused in a collective jaw drop last month when President Trump’s proposed budget was released and it eliminated the 21st Century Community Learning Center program. The only source of federal funding for afterschool programming, this cut will ultimately deprive students with the greatest needs of equitable access to meaningful afterschool activities. For those w ho have seen the power of these programs, Trump’s budget proposal is unacceptable. Beyond just helping with homework, afterschool programs offer kids enriching experiences focused on science, math and the arts, as well as activities to build character, physical strength and leadership skills. Afterschool experiences provide much more than just a safe place to go; students have an extended opportunity to socialize with their peers and engage in problem solving activities. Schools often use 21st Century funds to host family math and literacy nights, where parents feel welcome in the school. There they engage in similar problem solving with their kids and take home resources to bridge the learning in their homes. Cutting federal funding for afterschool programming sends an ugly message to Americans of all incomes. It’s like saying that providing these experiences is not of benefit to our communities, and continued learning during the hours of 2-6 is valuable only to those of privilege. Even worse, it communicates the idea that we don’t honor the work that educators do with our most vulnerable populations, when in fact, our afterschool programs are at the very heart of what we do in America. We believe every child has the right to engage in activities beyond school that provide meaningful struggle and will increase perseverance, something our kids with challenging lives desperately need to develop in order to succeed in life. Some may acknowledge that afterschool programs can be useful, but believe they are a luxury taxpayers cannot afford. In reality, these programs are a worthy investment for the communities in which they reside. The lasting effects from the work that is done at these schools and community centers cannot easily be quantified with political rhetoric or test scores. We need to maintain 21st Century funding and take it off the political chopping block.